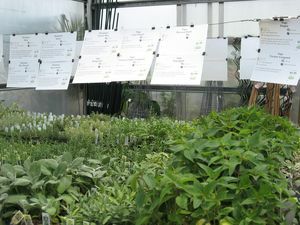 Rosemary and Sage are just two of the many varieties of herb sold at Milmont. The following Herbs are available at Milmont and are listed in alphabetical order. Due to our continuously changing inventory, you may wish to call us at (540) 943-8408 or e-mail milmont@milmont.com to ensure availability and to check prices. The Item # is included for your convenience. To check our list of Annual Herbs, please go to our Annual Herbs page. © Copyright 2019 Milmont Greenhouses, Inc. All Rights Reserved. Produced by Clarity Connect, Inc.